Chess is a tactical game two players play with each other. Each player commands 16 game pieces, composed by 6 different types of pieces, each type with different abilities. The main difference between the different types are their ability to move (direction, distance) and their ability to capture an opposing piece. The most restricted piece is the pawn, able to move forward (and only forward) one square  in a straight line and he can only capture other pieces sitting diagonally in front of him . Rook and Bishop can only move in specific directions (straight resp. diagonally), but in any of the four directions and over any distance (restricted only by friendly or opposing pieces). Both can capture in the direction of their movement. The Queen is basically a combination of the Rook and the Bishop, in terms of movement and ability to capture. The King, as the central piece to defend and determining defeat, shares the ability to move and capture with the Queen, but is limited to one square at a time. And finally there’s the Horse, which features a unique movement pattern and is the only piece which can „jump“ over friendly and opposing pieces. The number of pieces are not distributed equally. The layout consists of 8 pawns, 2 rooks, 2 bishops, 2 horses, one queen and one king. On close examination it becomes clear that chess is balanced on various levels to deepen the strategic aspect and challenge of the game. The most obvious level are the differentiation of pieces itself. It would be quite possible to imagine a version of chess only featuring Queens. Last man standing wins. The game would be quite a massacre, not involve much tactical thinking and be over very quickly. Okay, Queen=Bad Choice. Just Rooks then. That would take a little longer, but besides that it would be just as boring and uninteresting. Only if you start adding different types of pieces it introduces a dynamic which allows for tactical planning and trade-offs. The next level is the number of each specific piece. The weakest piece, the pawn is represented 8 times, while the most powerful piece, the queen, is represented only once. The king, as the game determining piece, is also represented once. The other three pieces are represented two times each. So the tactical value of a piece is counterbalanced by its numbers. And a final level, albeit indirect, is founded in the round-based nature of the game which enables a player to force his opponent to certain actions, e.g. into trade-offs by threatening two different pieces simultaneously, or to allow for “safe” captures by threatening the King. If you look at the complexity of Chess’ pieces one important aspect is the restriction imposed to them. Rook and Bishop are both toned down versions of the Queen. This leaves these pieces vulnerable to a complementary attack (e.g. the Rook can be taken diagonally from a piece able to do so). That would not work with a Queen. . Horse, King and Pawn are restricted in the range of their movement and can be threatened from outside their range. On the other hand special abilities - like the Horse’s unique movement pattern or the pawn’s ability to be promoted - give a class a strength which adds a special quality. The Horse, for example, is the only piece which can threaten the Queen without being „in the line of fire“ (so to speak). Also it can easily move „behind enemy lines“ to take or threat an opposing piece or even check the King. Then there is the aspect of pieces covering („protecting“) other pieces so that the opponent can’t take this piece without sacrificing a piece of his own. At this point I’m sure people who know chess (and those who don’t probably as well) will be bored, and might be wondering what the bloody hell this has to do with TF2? Well, given what I laid out so far one can easily call chess a game between two teams, each consisting of 6 different classes which feature different strengths, weaknesses and abilities, even special abilities. And all this is composed in a way that a complex system of those features creates a balance which is the base for a tactically complex and sophisticated match. 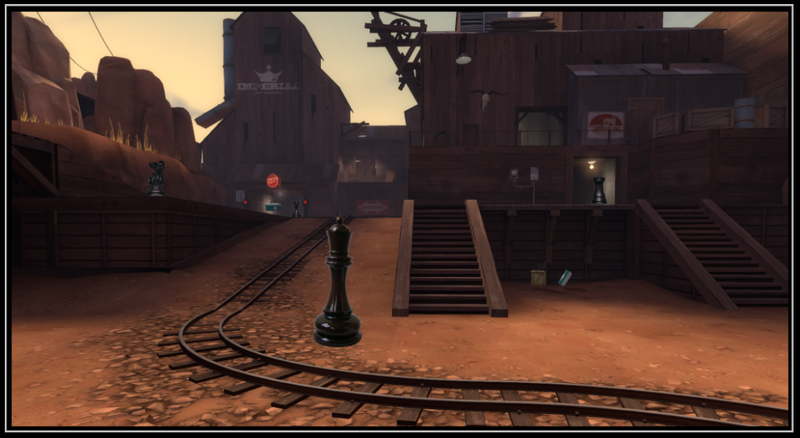 And while there are no direct analogies between chess and TF2 some of the aspects which help creating the balance in chess can be found in TF2 as well. The differentiation of classes in TF2 is even more complex than in chess, but this pays tribute to the different nature and requirements of the game. It is interesting to note that initially TF started with 5 classes (Scout, Sniper, Soldier, Demolitions Man, Combat Medic) and that the remaining classes were added later. But the nine-class structure has basically remained unchanged throughout TFC and now TF2 . What TF has tried to work out quite meticulously are the different levels of balance integrated into the classes. Since TF (by default) doesn’t limit the numbers of a class represented in a game all balancing has to be achieved within each class and between the classes. And similar to chess important aspects are inherent weaknesses of classes, a complementary strengths/weakness structure between classes and special abilities to create additional balance checks as well as adding tactical layers (e.g. the scout’s double jump, the spy’s cloak, the sniper’s headshot-capability, the soldier’s rocket jump). The difference in movement and range finds a (rough) equivalent in the different speed of the classes. All classes feature an intricate trade-off system between speed, health and power. Even the arguably less balanced class, the soldier, has still a lot of checks and balances. His high health and strong weapon is countered by his lack of speed. To some degree he can compensate his lack of speed by rocket-jumping but this happens on cost of health . His powerful and long-ranging rocket-launcher holds only 4 projectiles and is slow on reload. In a similar way it is no coincidence that the demo, as the other powerful class has been given no mid-to-high-range weapons. There are tons of similar balance trade-offs within each class and between the different classes, though to some degree some of the lines have been blurred by the different class updates. There are fewer hard counters, but still a lot of soft counters. But there’s one major difference. In chess a move is a move, and the outcome is predetermined by the rules. In TF the outcome of the encounter between two players is by no means predetermined but eventually decided by skill (of we put aside luck and surprise). Therefore such a reduced TF would still attract a lot of people, since the tactical simplicity of such a variation would increase the importance of skill. It would trade the tactical complexity to a more even power struggle. Under that consideration the inherent balance of a class and the balance checks between classes become secondary (at best, worse: unimportant, worst: a nuisance). Of course this is exactly what TF2’s competitive scene has settled on. They play chess with Queens and Horses. Drawing an analogy between Chess and TF2 might seem a bit far-fetched, yet some of the conceptional similarities are striking. And one important element of the concept in both games is the idea of weakness as a balancing factor within and between pieces/classes. This is a fact which one have always to keep in the back of one’s mind when discussing classes and considering any kind of changes (like we do often when – for example - imagining new weapons). The fact that Valve itself is losing sight of this in a few cases is a bit worrying, and I can’t help but wonder if it is a (perhaps subconscious) tribute to the different way the comp scene approaches TF2 *shrug*. This level of worry is not exactly alleviated when I look at the first results of community designed weapons. Which makes the Pawn an interesting exception, since every other piece captures only in the direction of movement. But since the Pawn is the only piece which can only move into one direction I assume the idea behind that capture pattern was two-fold: For one it breaks the otherwise linear movement pattern and enables more variations in draws and constellations, but also enables Pawns to block each other without the option to capture (which is another option no other piece has). Just as other concepts exist, amongst those the popular idea of 3-dimensional chess. And yes, the irony of that conclusion is not lost to me ... but more on that later. Does that mean those nine classes are the ultimate design which no longer can be improved? Not necessarily, but of the top of my head I couldn’t think of any substantial element missing which would have to be addressed by adding an additional class. On the other hand that doesn’t mean, either, that another class couldn’t work or add to the game, when designed carefully. Or – to stay in the computer game world – like regular deathmatch where every player has (potentially) the same weapons and abilities. While I certainly see the point (or at least what I think was your point) that overly complex classes make (and for me certainly made) the game less attractive, please don’t forget that a lot of balancing between the teams also happens with the battlefield itself. In chess, this balance is trivially achieved by having a perfectly symmetric map... errrr.... board layout. We’ve seen in TF2 that while symmetric layouts reduce the team balancing to mere class choice (which coincides nicely with your chess analogy), they also lead to frustration and stalemate heaven. I happen therefore to like the approach that TF2 is taking with pl_ maps, which gives both teams different opportunities for having a rewarding game experience. A good game should have some sort of pacing, giving you time to breathe. L4D tries this through the AI director, whereas in TF2 this sort of thing is purely up to the map design, because there simply are no other ways to influence the players’ actions. tl;dr: Don’t forget that classes — while possibly a major factor — are not the only thing that make the game good or bad. Err... you’ll stir up a hornet’s nest with remarks about the competitive scene like that one, Tea. I see where you’re coming from, but really it’s the individual skill that sets the "comp" pieces apart from the others. In chess, one does not have to be particularly skilful with the Queen, say, to "play" her effectively. The Queen will determine some possibilities of movement and strategy that can be taken or ignored on each turn. What the pieces can be used to do is not affected by the skill of the player; the same moves would be available to all players in one particular situation, due to chess being rules-based. Now in TF2, take a class like the Sniper. His "rules" say that he can kill any other "piece" instantaneously with a charged headshot. Now, if we are to put the Sniper in the hands of two differently skilled players, you might have one player to whom the option of seeing someone pop around a corner and instantly killing them is readily available, and he can "snap-shot" anybody with his fast reflexes. However, in the hands of another player, the "rules" do not apply, because while the Sniper inherently has the ability to instantly kill the Scout coming zig-zagging towards him firing the pistol, this "rule" is not available for somebody who doesn’t have the reflexes and the aim. Take another class, the Scout. His "rules" state that he is good at using his speed and jumps to dodge attacks. But again, this is only available to players who can actually use it. Now, extending the Chess analogy to competitive TF2, the classes that are used are used simply because they envelope most of the "rules" present for other classes when in skilled hands. Why aren’t Engineers used, for example? Well, because a skilled Demoman has the same ability as the Engineer to deny an area to the enemy, while also possessing "rules" enabling him to do many other things, in a more versatile way. Of course, your average player might not be able to do these things as well, so would instantly look to the Engineer for area-denial, which is fair enough. But why would you pick the Engineer if you could do his job as Demoman, and accomplish more still? The Spy (while sometimes used in comp play, albeit rarely) is enveloped in the same way by the Sniper and the Scout, both of whom can "pick" off individual targets and be useful in different ways (the Sniper also being capable of effective area-denial and straight combat, the Scout very much being more apt for team-based objectives and fighting). But again, take Average Joe Public and he might not be able to jump in and kill a Medic as a Scout, but as Spy he manages just fine. This is how TF2 crucially differs from Chess in this analogy: in Chess, each piece type is invariable different, as defined by the hard-and-fast rules. In TF2, each class has different "rules" available to it when played to a certain standard. Also, while there are limits in place for each type of class in competitive play, they can be freely switched between, enabling just as rich a variation in roles to expect from enemy players as in public play, just accomplished with a smaller variety of classes. Addressing the main point, though: You’re absolutely right that the class updates need to avoid making all "pieces" ostensibly the same. If this ever happens, it will cease to be TEAM Fortress 2. "you’ll stir up a hornet’s nest with remarks about the competitive scene like that one"
They would have to read it first Besides that, I already laid down my opinion about competitive TF2 (here and here). But actually my remarks about competitive TF2 were more a side-product of a train of thought. The article is basically more about the design of TF(2) than actual gameplay. My initial (and primary) goal was to stress that weaknesses and restrictions are an essential component of the design of the TF-classes. I’ve often felt that a number of people consider those an obstacle, an annoyance they would rather seen removed or circumvented. They would rather have a soldier or heavy been faster, or would rather have heavier weapons for some of the medium or light classes. IMHO Chess is suited to show a class based system (almost) everybody knows which thrives exactly on a mix of strengths and weaknesses to create a balance to demonstrate the design ideas. You are of course right, in regard of gameplay the analogy no longer holds (but that was never the intention and I don’t think I indicated otherwise). But I admit I don’t completely agree with your assessment. A demo and an engy are not the same. A spy adds a different element than the scout or sniper (which to my knowledge is not that commonly used anyway). The classes are distinctive enough not to be completely interchangeable. However, the 6vs6 format has made some classes more useful (or valuable) than others. Coming back to chess for another crude analogy: If you would decide to play chess with just 8 pieces, which pieces would you use? You would probably discard 6 pawns, a rook and a bishop (keeping 2 pawns for potential conversion, and only because of that). That’s (again: crudely) the elimination process which happens in competitive TF2. It’s the result of an artificial and arbitrary format, but not necessarily a result of the class design.